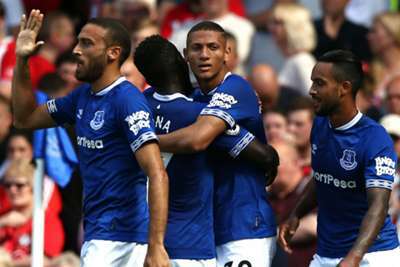 Richarlison continued to ingratiate himself to the Everton supporters by scoring in a 2-1 Premier League victory over Southampton at Goodison Park on Saturday. A fee that could reportedly reach £50million raised eyebrows upon Richarlison's arrival from Watford, but he added to his debut double to give Marco Silva his first competitive win at the helm. The Brazilian converted a cross from Theo Walcott, who opened the scoring against his boyhood club in the 15th minute following a delightfully worked set-piece routine. Danny Ings, roundly booed by the home fans, pulled one back for Saints on his first start since arriving on loan from Liverpool, but the visitors were unable to salvage a point. Southampton's sloppy defence was punished when Leighton Baines sent a free-kick short to Morgan Schneiderlin, who flicked a no-look pass through for Walcott to poke past Alex McCarthy. Everton lost Schneiderlin to injury and matters almost got worse when Jordan Pickford deflected a shot from Ings onto the bar, having initially spilled Cedric Soares' swerving 25-yard drive. The Toffees nevertheless extended their lead when Richarlison – just two minutes after staying down due to an awkward fall in the box – nodded Walcott's delivery home with a touch off Cedric. Ings had been a consistent threat and he was left in acres of space to sweep home Mario Lemina's flick-on from James Ward-Prowse's corner nine minutes after the restart. But Southampton could not maintain their momentum and McCarthy kept out Idrissa Gueye with nine minutes remaining as Everton comfortably saw out their first win of the campaign. It looks like Everton can only get stronger after this result - new arrivals Lucas Digne, Yerry Mina, Andre Gomes and Bernard were not even included in Silva's squad on Saturday and Kurt Zouma was an unused substitute. They will add serious quality when deemed ready for regular action. 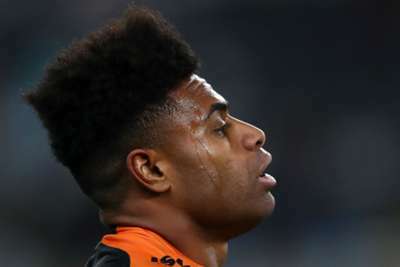 The Toffees looked well-drilled and dangerous, particularly from set-pieces, under the Portuguese, while Southampton struggled to fire after switching to a four-man defence due to Jannik Vestergaard's absence through illness. Mark Hughes needs to find the right formula quickly or Saints could be facing a long, difficult season in the Premier League. The arrival of Brazilian winger Bernard will provide Walcott with greater competition for a starting spot. The former Arsenal star showed his quality with a fine finish for the opener and an expert ball to set up Richarlison, though he should have added to his tally when he dragged wide in the 69th minute after neat interplay with Gylfi Sigurdsson. Charlie Austin was Southampton's highest-scoring player last season with seven goals in all competitions but he lacked sharpness on Merseyside. He was unable to find the target with any of his three shots on goal and struggled to link the play in Southampton's new shape. - Everton are unbeaten in their last 14 home league games against Southampton (W10 D4), since a 0-2 defeat in November 1997. - Theo Walcott has scored and assisted in a Premier League game for the first time since January 2013, for Arsenal against West Ham. - Danny Ings has scored three goals against Everton in the Premier League (in six games), more than against any other side. Southampton will look to pick themselves up when they entertain Leicester City at St Mary's next Saturday, while Everton travel to Bournemouth and could finally be bolstered by their new additions.